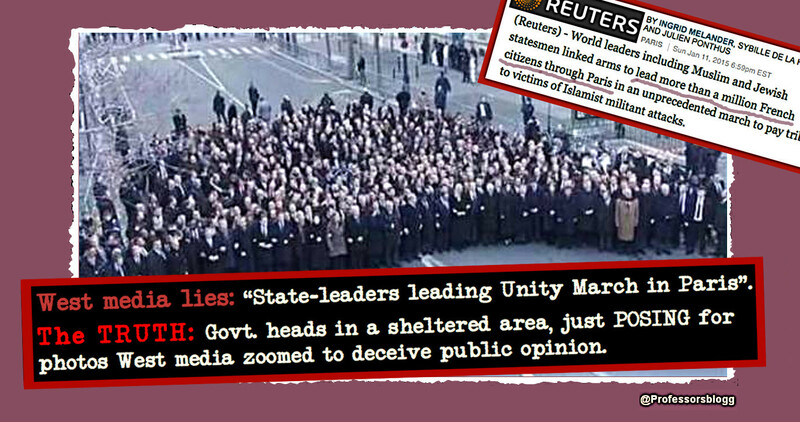 Here, some evidence on the Western media deceptive reporting of the state-heads gathering in Paris. 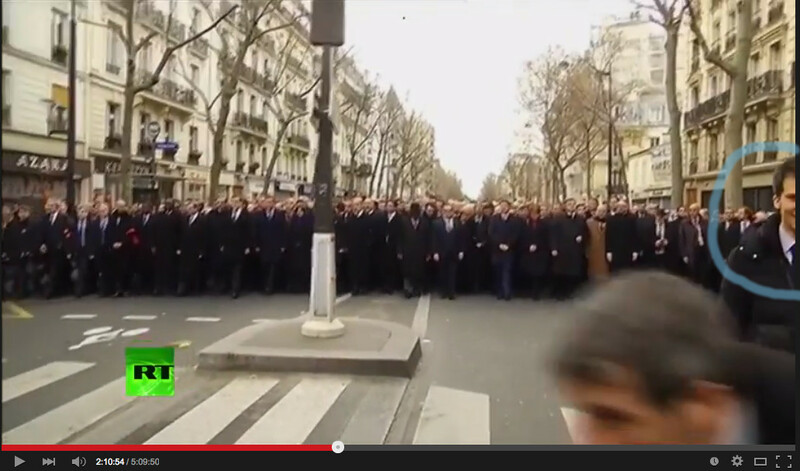 The material analyzed in the Professors’ Blog has consists mainly in a five-hours filming of events around the demonstration “Unity March” in Paris, published by RT. Also other videos were considered. 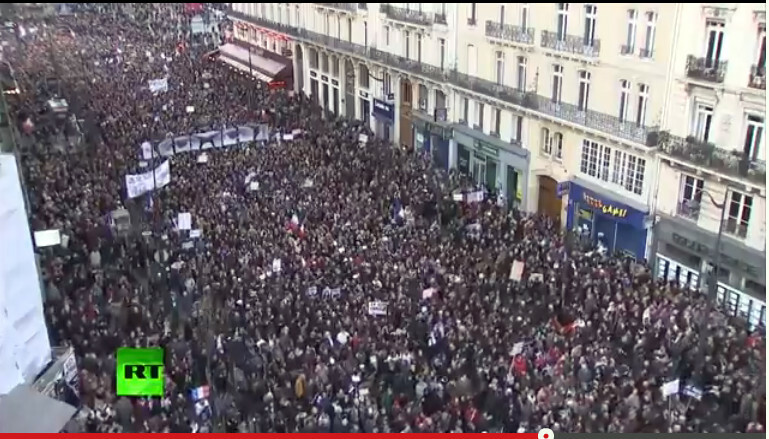 Judging from the sequences, a fair conclusion would be: a) the participation of the world-leaders in association with the demonstration in Paris was staged all through; b) They never actually “led” the over one million demonstrators through Paris” – as deceivingly was informed by Western media; c) Further, the small three groups of demonstrators showed in some videos in conjunction with the world-leaders performance), appears in the main composed by security or military people disguised in civilians clothes, staff or reporters. What was behind the Western media deceit? 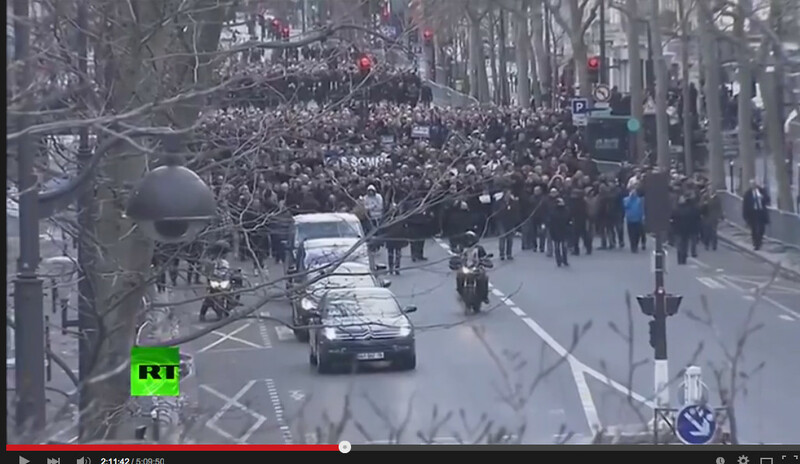 The bloody killings in Paris naturally shocked, massively, citizens of France and all Europe. The deeds also resulted in spontaneous protests against this new emergence of terrorism in Europe. However, those understandable feelings by the public were rapidly manipulated partly by those in power – principally belligerent states such as Israel. Partly also by the European far right parties – added Nazi and fascists formations – to move their own fanatic positions in their “holy war” against Muslims, Muslims immigrants, Muslims refugees, or Muslims asylum seekers in Europe. The French National Front announced today that “we must respond to the war”. Altogether, over hundred of terrorists acts were committed in Europe against Muslims religious institutions or buildings, in the aftermath of the Paris killing at Charlie Hebdo. For its part, NATO and its client states uses the drama of the Paris killings to legitimate new “surveillance measures” amidst further tightness of our civil liberties and integrity. And for Western media, this was a unique opportunity to present – albeit falsely – a united front of Europeans and other countries in the xenophobic crusade MSM has been leading in responding the re-emergence of ‘anti-colonialism’ in Africa, Asia and the Middle East. For Western media the issue has never been a matter of exposing terrorism as such – as they claim. This stance is proven everyday in the MSM efforts to distort the truth on the state-terrorism practiced for instance in Gaza by Israel, or in Donbass by Ukraine, both governments backed by NATO. In the context above, West media reporting on the tragic events in Paris and its political sequelae has been sensationalistic, distorted, and plainly deceiving. 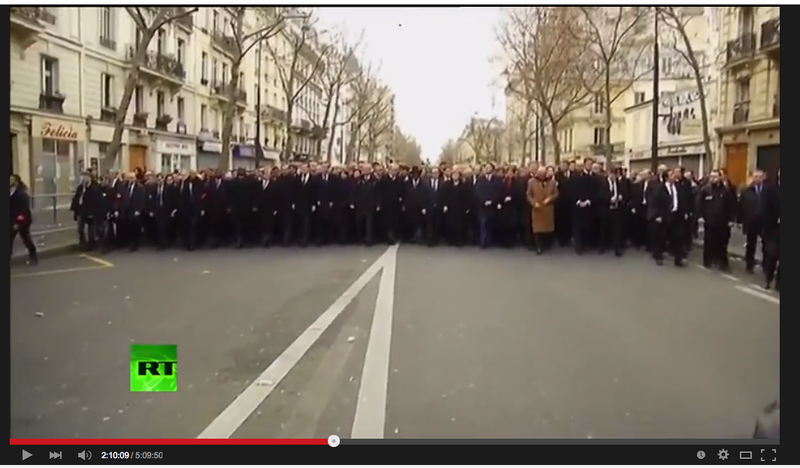 One main illustration is giving by the MSM reporting on the recent Unity March in Paris. It was not completely so, because the state leaders and aids did produce some steps – not really a walking, and absolutely NOT a “march” – during a few minutes. I describe this down below. Nevertheless. 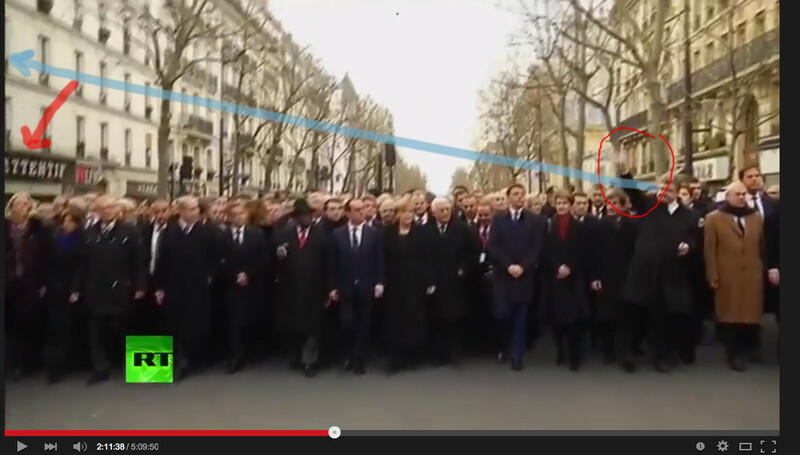 One problem in analyzing the videos has been the heavy zooming that has been used by graphic reporters and outlets. The zooming occasions a highly confusing estimation of the long-side distance between objects, people, or in this case formations of stage ‘demonstrators’. This would understandable for three reasons: a) Security precautions keeping graphic reporters and equipment at distance; n) necessity/convenience of having stationary cameras to reach a paramount and deep field, for which distance is a must, and the the zooming ensues. 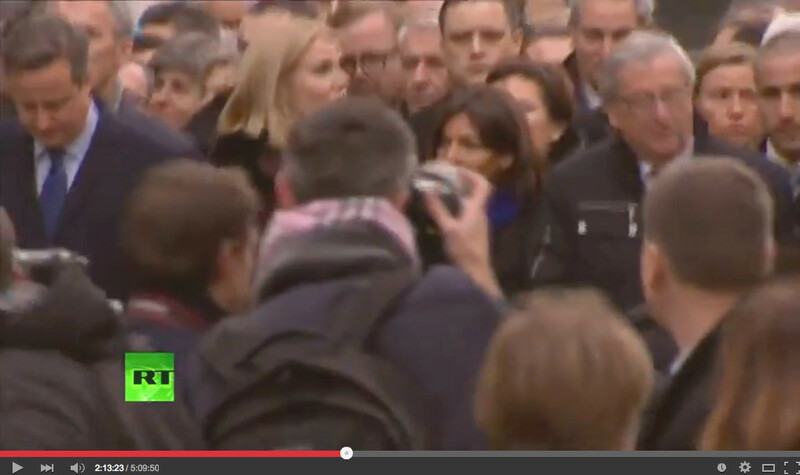 Another problem is the editing done by RT on order to give a “coherent picture” of the event. This means that sequences are repeated in different time.lapses of the video but that not match a ‘sequential time’. Further, some sequences correspond to earlier moments of the stage-procedure. 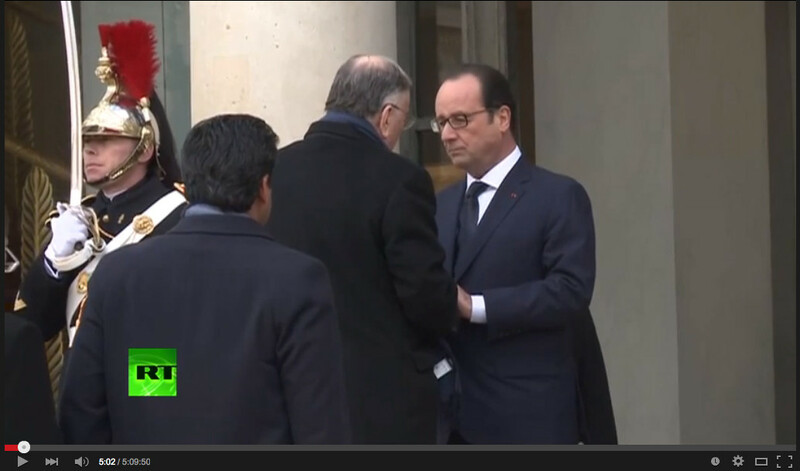 F irst, the head of states were received by President Hollande, and gathered at the Presidential Palace. In the image below our Prime Minister Löfven arriving in a Swedish Volvo with the state flag. 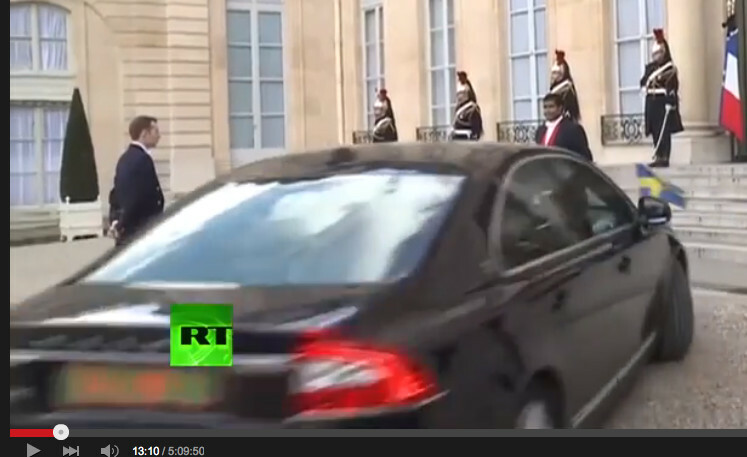 I notice in the video that only very few official-cars transporting the state-heads dared to travel through Paris with their flags. 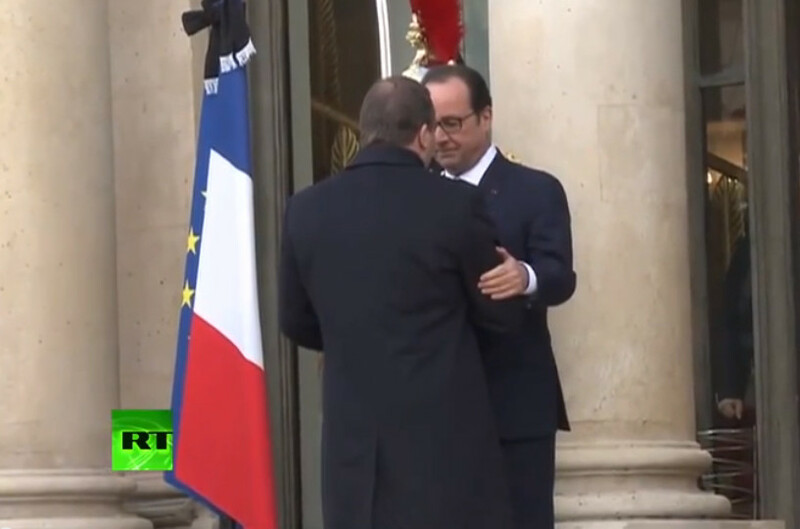 Löfven was, together with Russian FM Lavrov the only (or the few) to whom President Hollande offered a bid of extended dialogue at the entrance, on the occasion of the welcome greeting at the Élysée Palace. Then the state-leaders and their parties were then collectively transported to the stage-site. 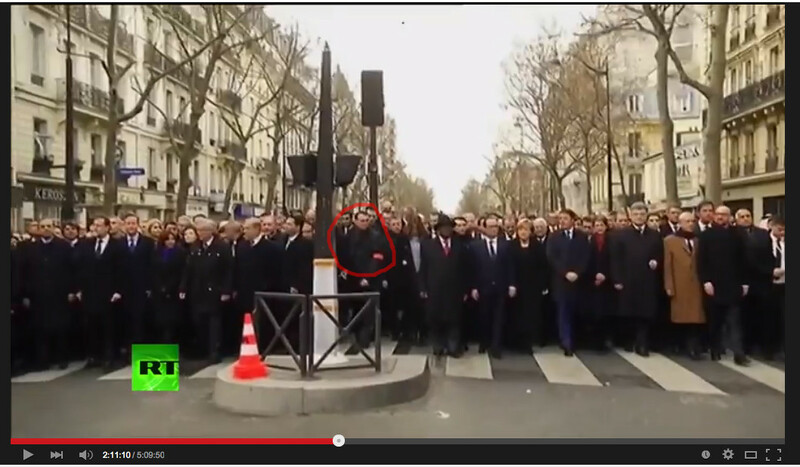 Observe the man in the red circle, guiding the way. He will re-appear in sequences below. After arrival, the head of state are formed in rows. The reason why the state-leaders appears in a variety of positions in the different photos of the event, is precisely because it was not a march. The procedure consisted in posing for the pictures, then walk one minute (not more for the most), then stop again and mingle. Then “walk” again another half-minute or so, and again stop. The stage was led by this man indicated in the light-blue circle. He is the one that says when to stop for the photo-taking, the arms-waving, the one-minute walk, etc. Here the director signals the second stop. (As I said, posing, march one minute, stop, posing, march another half-minute or so, stop, posing and THAT’S IT. There is no spectators at the side walks. Only uniformed police standing. 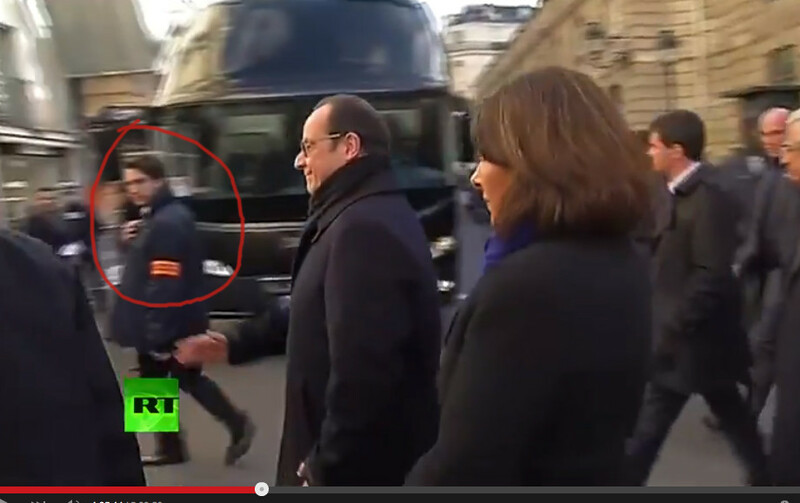 The person marked in the red circle APPEARS to retransmit the above communicated instructions to President Hollande. For instance here in the moment of the picturing, instructions to stop. Or alternative instruction to continue the short “walking” at the stage-site. The stage-‘marches’ lasted only just one or two minutes, or so, each. In total they were four to five of those “marches”. But I cannot be completely sure if the one in the red circle is the same person depicted below wearing the red arm-distinction. 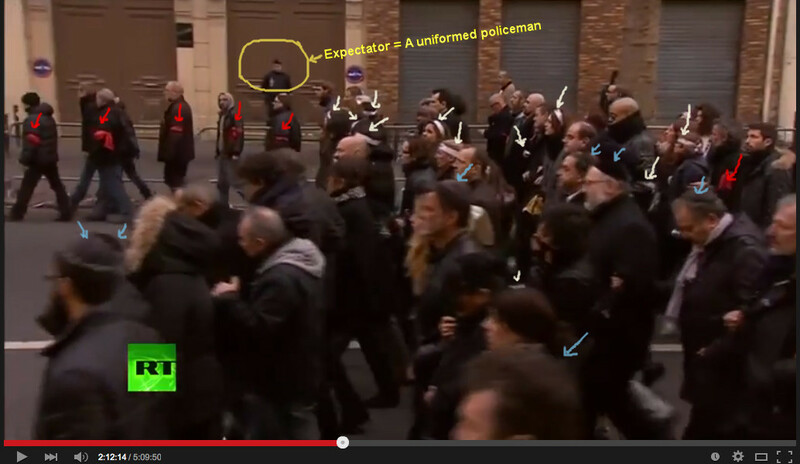 A distinction used by French police officers in civil garments, posing as the stage-demonstrators. The photo below was published by Reuters. 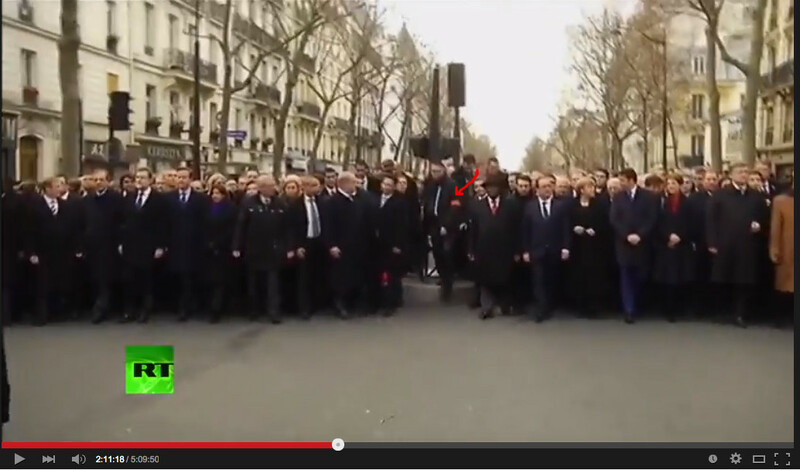 The officer, here below with the red band distinctly on display, emerges from the crowd of state-heads only due to the elevation on the road, which he had to climb over. 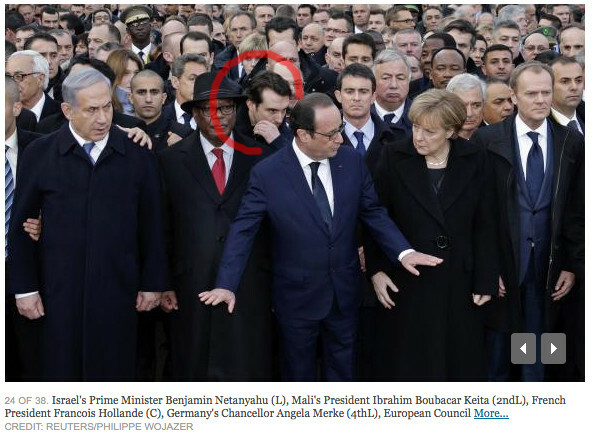 After he steps down, he will again being occult beside/behind President Hollande. 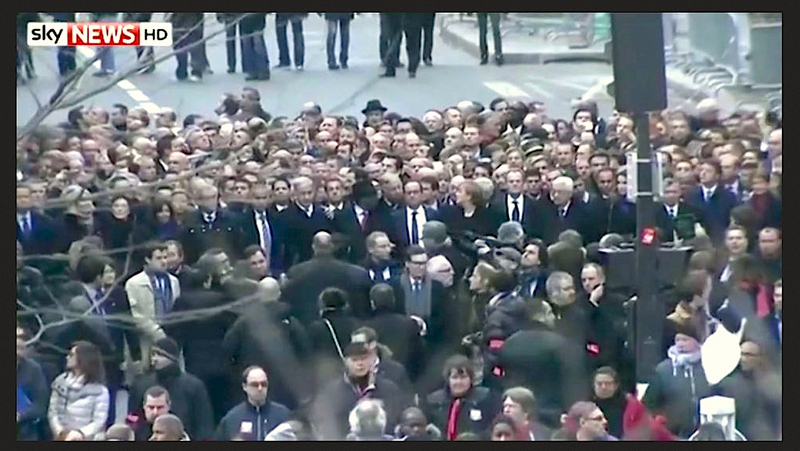 This below, an image by SKY-News found in the Internet (possibly a still from a video sequence), shows a more natural positioning of reporters and graphic-reporters, staffs, and the main actors of the stage. The image gives also, on spite of the zooming, a better perception on the dimensions of the stage-scenario. 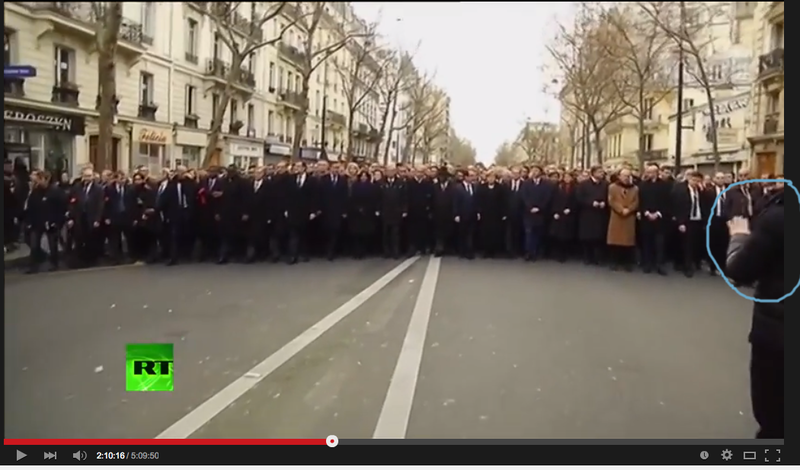 The actual separation between the heads-of-state delegations with regard to the first “demonstrators” group (mainly police in plain clothes) was in reality much longer than the one given by this zoom-image. 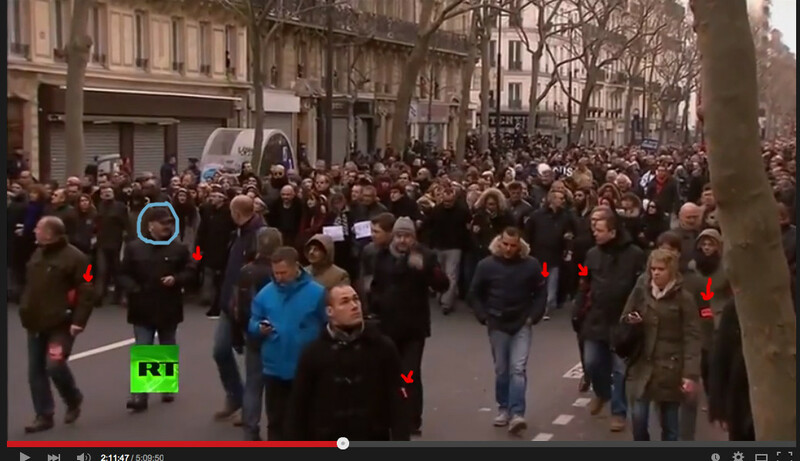 Here below, a still I took from the RT video, shows the proximity of the reporters.And this is taken from the crowd of reporters. 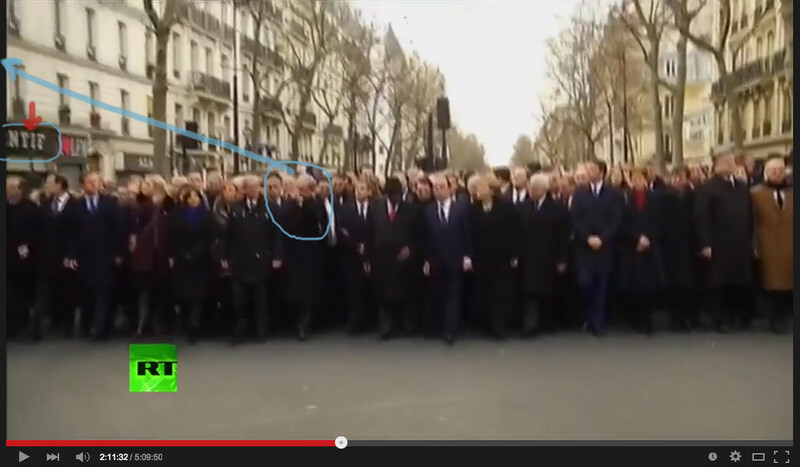 Now, this are the two columns that were positioned way behind the heads-of-state group – COMPLETELY separated from them. The four cars, respective subs are civil police vehicles. As the two motorcycles with police in plain clothes. Please observe that this is a heavy zoomed photo. Hence, the real distance is way longer that the impression given by the image. It is not at all clear in the videos I have checked on the event whether this column started to advance AFTER the state-leaders left the stage. 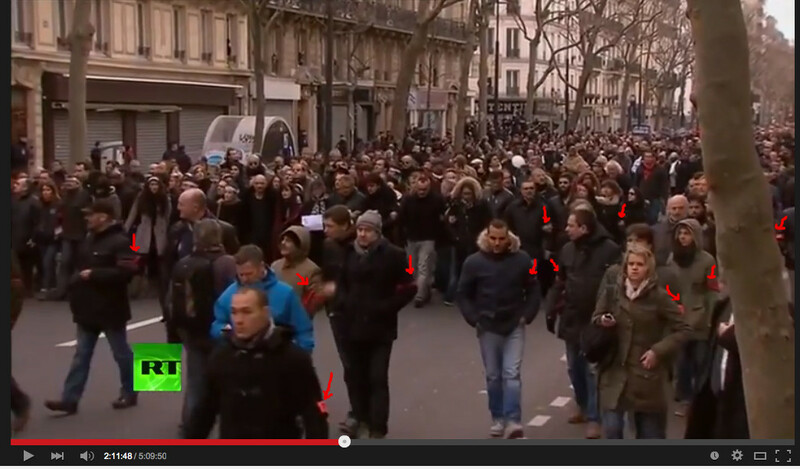 You will observe who were these “demonstrators” in the sections below. These are the “demonstrators” that were in two separated columns – exactly as in military company-formations – stationed an estimated 200-300 meters from the heads of state. The company appears to be only 20-30 meters deep, or the equivalent to 10-12 rows (‘escuadras’). The red recognition-marks on the arms indicates the “military” operation routine. 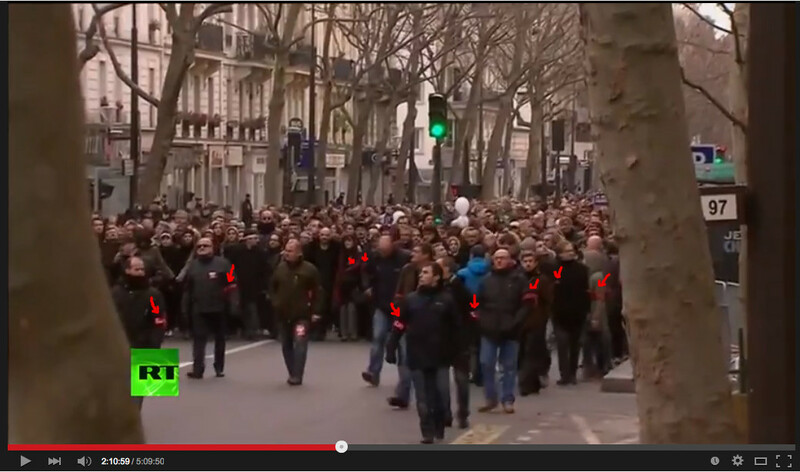 There are many of them, and as the angle of the camera moves a bid, or the people turn a bid, more and more red recognition-marks appears on further “demonstrators” arms. Below: the ‘demonstrator’ in the light-blue circle shows when hr turns he is having a communication device attached to his right ear. 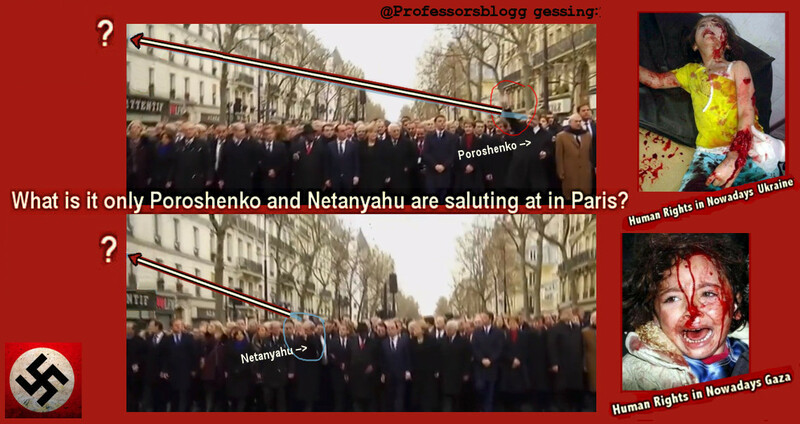 Here we see both Netanyahu and Poroshenko directing a salute to the same symbol or situation, or people perhaps in a balcony holding a banner with a special text or symbol. What that symbol could be? January 15, 2015 in Uncategorized. A Swedish Extremist Right-wing “Diplomacy”? Or Bildt’s Solo Support To Ukraine Nationalists?